So Here I Am. Writing. Again. Lately I’ve been receiving intuitive nudges to write more, specifically to set a goal to write here on my blog every day. It’s a tall order, I won’t lie. The spirit is willing, very, very willing, but the flesh is mostly weak. And since today is the first of the month it would seem like an auspicious day to start such a personal challenge. Or re-start it, should I say. It’s a good day because the first of the month always feels like a clean slate, an opportunity to re-commit to your goals. It’s also a bad day because on Friday I am going away for a week’s holiday and although we always book a place with WiFi, my travelling companion gets on my case if I spend too much time using it. Fair enough, I’m supposed to be on holiday after all and not much of a companion if I am engaged only with my virtual world. A proper professional writer would, of course, have at least a week’s supply of blog posts up her sleeve to be auto-posting while she was away on holiday, but that’s not my goal. My goal is to write every day, in real time. And to hit the Publish button. And that might be mostly on my blog but it will also be on my newsletter and in other places. I haven’t thought of those yet, but I will. It is now a year since I embarked on a writing course with Joshua Fields Millburn of The Minimalists and his advice was to schedule time every day to “sit in the chair”. If you are committed to write, you sit in front of the blank piece of paper or the computer screen until the words flow. And flow they generally do, some days better than others. And I am on my 427th day straight of writing seven hundred and fifty words a day at 750words.com. I even managed that on Christmas day so I know I can do it. What’s the difference then? Why can I do it on 750words but not here? The answer is that 750words is personal, for my eyes only. I use it like Julia Cameron’s Morning Pages and I write because I must, because you get busted back to zero if you break the habit and I don’t want to lose my 427 days. There’s something at stake; I have skin in the deal. But here, when I press Publish the whole world can see and read and comment and feedback and be critical. Generally the world is either kind or indifferent to my writing but one of the things you discover when you write online is that some people have very strong opinions and one such expressed can take away my overly-sensitive writer’s voice for indefinite periods of time. It happened earlier this year, so I know whereof I speak. It’s very real and it’s painful too. But it goes with the territory and its part of the deal. And there’s my reluctance, outed. One of the things I always tell my writing clients is this: writers write. And we cannot call ourselves writers unless we sit in the chair every day and ultimately press Publish. What is the point of our words in a vacuum? Writing is a communication art form and therefore my words must be read to complete the circle, to make the project whole. I’m a better writer than I was when I started writing online about a decade ago, but I’m not a patch on the writer I could be if I were to man up and commit to publishing every day, somewhere, online. Every day for the rest of my life, starting today. I told you, it’s a tall order. We are only a month away from NaNoWriMo, the month of November when writers commit to writing a novel in a month. It is doable, for sure. OK, you wouldn’t be ready to publish on 30th November. In fact, NaNoWriMo recommend that you put your writing aside until about February before you even start to edit it. The point of November is simply to do the writing, to get the words out of you and onto the page, digital or otherwise. And that might be the perfect challenge next month to up my daily word count. Perhaps. And so my writing October could be a warm-up for NaNoWriMo and though I am certain sure I don’t have a novel in me, I do have words in me that I want to share and I do want to be a better writer. 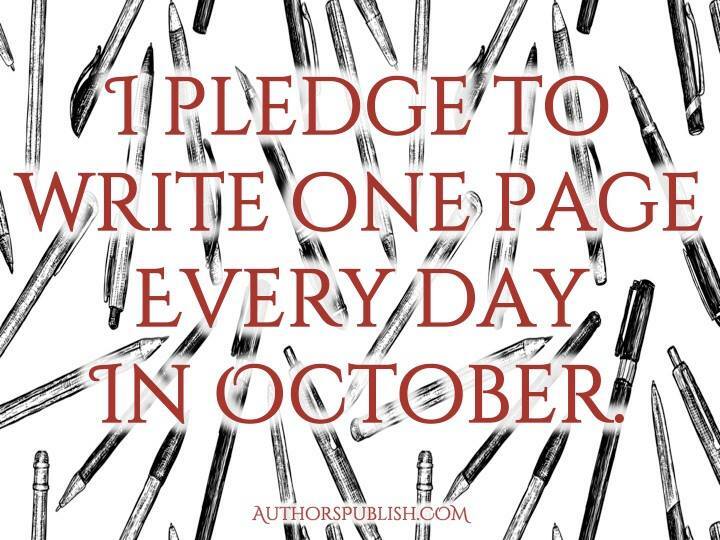 I do want to write every day and press Publish every day too and I love a challenge. Ish. Ah, and there I thought I’d explained why in the first sentence! I’m receiving intuitive nudges to write daily and I’m following them, showing up as it seems is my destiny. It is a determination, but not a grim one. I think the point I was trying to make about 750 words is that I started out with that on 1st August 2012 not knowing if I could do it every day and I discovered I could. It’s just a habit. And as with any new habit, forming it often takes some determination, just until you are over the starting hump, as t’were. No, sorry, but your games would be a real turnoff; the difference between a Mechanic and a Creator? I don’t feel I will struggle with this in the medium and long term. The short term struggle, such as it is, is explained by the responses I sometimes get, the ones which cause me to stop writing regularly on a public platform but, again, it goes with the territory. Be useful for me to toughen up in this regard, though I shall remain a pussycat in every other regard! I appreciate your comment and involvement in my project. Let’s see how it unfolds? It’s Day Two now, and I am quite excited… so far. Judith, you certainly are a writer, you have the skill and the inspiration. I totally get why you do 750 words. In this piece I’m not quite sure why you are starting again… I don’t get a sense of inspiration or eager anticipation of your task, just grim determination. While I suspect you can, why would you want to? Have you thought of making a game out of this for a month? Thinking of companions who spark your sense of fun, maybe you and Marion could challenge each other to write 400 words around a word or phrase given you by the other? Think of it as a verbal tag game. Unpredictable? Open to mischief? Potentially amusing or frustrating in equal measure… All of the above and more. Would that be more appetising or a real turn-off? Inspiring read Judith, thank you. For what its worth, I’m with you; it might be a stretch for me to go from zero to full-pelt publishing in a day, but I can certainly write something intended for publication each day. Blog post one is currently in creation!